Spring Garden Road Memorial Public Library had a fascinating and significant history. The building was constructed as the first public library in Halifax in 1951 and as a memorial to Halifax's WWI and WWII casualties. Moving out of this historic building required careful consideration and consultation with the Royal Canadian Legion. This is how we managed to ensure the library's legacy. The Halifax Regional Library Board committed to preserving the memorial aspect of the Library. As such, staff were directed to engage?actively in discussions with the Royal Canadian Legion. Working principles were developed to ensure a smooth transition of the war memorial before Halifax Central Library was completed. Halifax Public Libraries will preserve the original intent of the Memorial within the new Central Library. 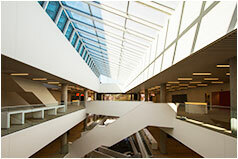 A rededication ceremony of the Memorial will be held with the opening of the Central Library. Consideration will be given to an exterior designation, either outside of the Central library or on the original site, relating to the Memorial. Consideration will be given to commemorating the Memorial in a room, or an area, in the new Central Library. Consideration will be given to developing an additional Memorial book with lists of war dead in subsequent conflicts. All plans for the transition of the memorial will be developed in consultation with the Nova Scotia/Nunavut Command, The Royal Canadian Legion.